Selina Tusitala Marsh debuts on the National Library Poet Laureate blog with diary entries that provide a candid snapshot of life, poetry and keeping a secret. I love the way poetry and life smudge up against each other. This entry was posted in NZ author, NZ poems, NZ poetry, Uncategorized and tagged NZ Poet Laureate, selina Tusitala Marsh on September 13, 2017 by Paula Green. This is a golden opportunity to nominate a poet for this. I have a poet in mind and plan to write a letter saying why he or she is the perfect man or woman for the job! I love the way the Poet Laureate adds value to our poetry communities during their tenure – with appearances, publications and contributions to the Poet Laureate website. 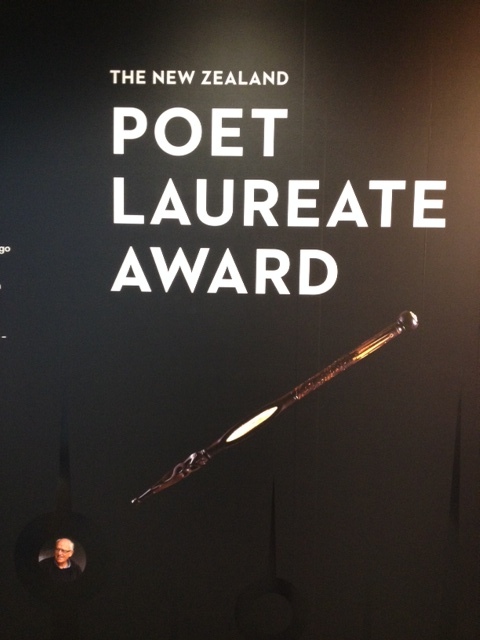 The National Library is calling for nominations for the next New Zealand Poet Laureate. The Award of Poet Laureate recognises an outstanding New Zealand poet, who receives $80,000 and is supported by the National Library to concentrate on their own work, take part in literary events, and utilise the Poet Laureate blog. 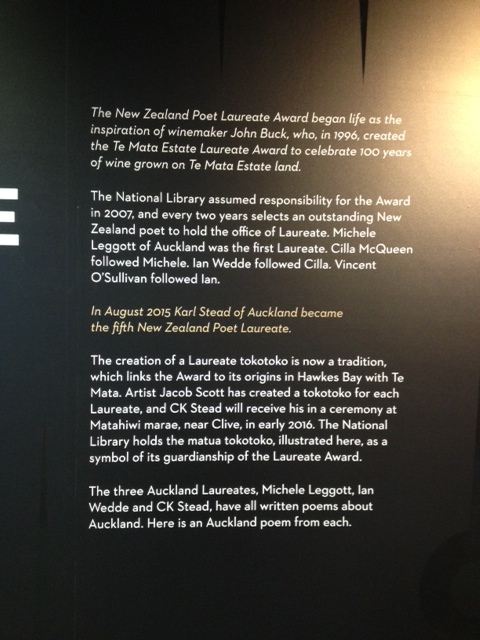 The Laureate also receives a tokotoko created by Jacob Scott and a stipend of wine from Te Mata Estate Winery (who began the Laureate Award in 1996 and supported it until 2007 when the National Library assumed responsibility for it). Nominations close on 11 August, and the new Laureate will be announced on National Poetry Day, Friday 25 August 2017. For further information and a nomination form. This entry was posted in NZ author, NZ poetry, NZ poetry event, Uncategorized and tagged National library, NZ Poet Laureate on June 19, 2017 by Paula Green. This weekend friends, family and poets gathered to join CK Stead celebrate his Poet Laureateship and the presentation of the tokotoko. It was a marvelous occasion that will stand in my memory for a long time. The weekend featured two key events. The formal and informal proceedings at Matahiwi Marae on the Saturday morning and a Poets’ Night Out in the evening. With exemplary dedication to New Zealand poetry, Te Mata Estate’s Peter Buck and poet Bill Manhire established the award twenty years ago. In 2007, The National Library took over the administration, although the Buck family still remain involved, and donates a stipend of wine to the Laureates. Unlike most of the visitors, I got called onto the marae on the Friday evening with Chris Szekely and Peter Ireland from the National Library, and a number of their colleagues, including Oliver Stead and his son Isaac. Peter was the driving force behind detail of the weekend, and Ian Wedde’s moving tribute to him at The Circle of Laureates hit the mark. Thoughtful, attentive, committed to making a celebration fit for a Laureate. His back-up team are pretty special too (Joan, Cellia Joe, Lynette, Jason and Oliver). Kaumatua Tom Mulligan and other members of the marae welcomed us with much aroha. Joan, Cellia, Jason and I practiced some waiata back in the whare nui. CJ on ukulele.We crack up when CJ says all her family knows she can’t sing and she just fakes it. We are all fooled and I wonder what I can’t do but could fake and get away with. On Friday night we hived off to Havelock North (one poet, five librarians) for dinner at Maine where the food was divine. We fell greedily into the comfort of the best hot chips ever and with that salty comfort digging deep into our bones were ready for whatever the weekend delivered. One plate of salmon with the best Niçoise salad and I was ready for a weekend of poetry and celebration. I got up early to walk in the near rain and saw a black cat stock still on a fence post eyeballing my lack of sleep. Not budging an inch until a car came down the gravel road and sent the cat sliding down like a snake into the golden corn. I had no idea what it meant. But it glowed with options. CK Stead was called onto the marae with his whanau (around 20), poets Gregory O’Brien and Chris Price, her partner Robbie Duncan, and other guests. To have such family support felt very special. He is poetry but he is most definitely family. His daughter had travelled from London with her children. At that we all paused. I am delighted that the Poet-Laureate role honours our elders, our writing taonga. It felt good to be part of the protocol. The talking. The listening. The exchange. MC-ed by Marty Smith, the informal part of the morning was like a miniature poetry reading. As his invited poets, Chris, Gregory and I read a couple of poems and Chris sang a Bill Manhire song with her partner Robbie. What made this section special were the performances from local secondary students. One student used the analogy of a bird to explore the Poet Laureate’s original function to write poems on dictated subjects. She was keen to let a Laureate fly free! A student played a solo violin piece, one sang a Māori version of ‘Hallelujah,’ while another wrapped up the morning with Van Morrison’s ‘Moondance.’ Wonderful! I pictured us all dancing slow motion with the wind in our hair. Instead the wind whipped the music sheet up and away. It was a morning of korero, waiata, music and poetry and it felt good to inhale both words and song. Nourishing. We moved to the whare kai where a tremendous lunch of fresh local produce matched the hubbub of conversation. You don’t get to experience many days like this in your lifetime. Such warmth, and connections. Marty Smith was the MC extraordinaire in a poetry reading of two halves. It’s ages since I have heard Chris and Greg read, but to hear them read in this context was something special with poems handpicked for the Laureate occasion. Greg read a terrific poem now showcased in the selection of Best NZ Poems from 2015, while Chris confirmed that her new book is her best to date (we have an interview in the pipeline!). Three young opera singers from Project Prima Volta wowed us with two arias. The room befitted the occasion: white cloths on tables, astonishing flower/plant arrangements, platters of food, Te Mata wine. Karl started and ended the night and showed very clearly why he is Laureate. He read across his range and his last set gave me goosebumps. The clarity of voice, the poetic strata, the acute detail that makes you want to pick up your pen and write. Breakfast and poroporoaki for everyone on the marae. The goodbyes. At breakfast Karl and I talked about the weekend and how we both spent chunks of the night wide awake as though we had to rehearse the next day and analyse the day before. I probably had about two or three hours sleep a night and it seemed like a state of wakefulness that kept me on high alert. What had happened, what was about to happen. I had brought seven books to match most moods (everyone laughed at my big bag of duvet and books) but I only got to read snatches of The Lie Tree. The gap between YA fantasy and the marae was unbridgeable. I got up early and walked my way into wakefulness before Emma Scott, Jacob’s sister, took me out to the river mouth and then coffee at her brother’s house. To see the meeting waters, where river meets ocean, to soak up the gleam of sun on waves and estuary, felt like a poem on the surface of the world. We talked and we looked. Emma is a stone mason. We talked about poetry and we talked about stone. We talked about what holds things together. It matters that we hold up our treasured poets. Give them a place to stand and speak. There was much korero after breakfast, and song. Chris and Robbie sang a mesmerising Bob Dylan number, almost lullabying me into necessary slumber. Peter Ireland, running on empty after little sleep, spoke with characteristic thought and thanked everyone personally. It felt like a garland of words to wear out into the world of planes and trains and motorways. Or for me, a place of solitude and bush. Jacob said it beautifully. He said that the Poet Laureate was significant for the marae. That it spread the hapu’s power and influence. That this is now Karl’s place as well. The undercurrent is that poetry matters. 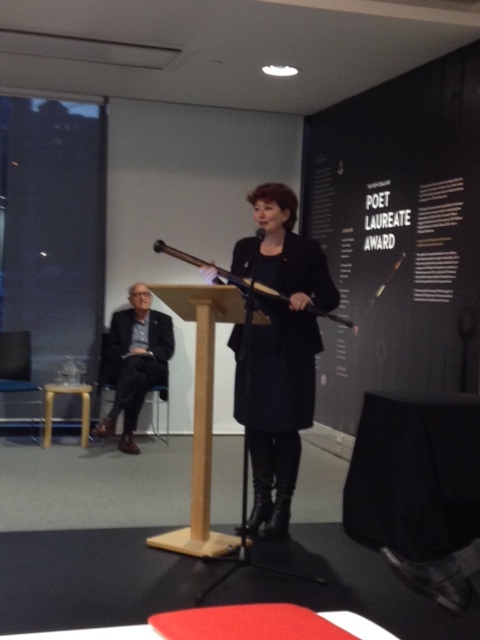 Jacob said it is significant ‘that the Poet Laureate can articulate the thoughts and expressions of who we are. Of what we can do. Of what we have got. And what we could do.’ Like a bird. We all felt in debt to Tom Mulligan and his drawing together of this poetry clan. With much aroha and generosity of place, stories and a willing ear. Our heads are full of days we cannot remember, but for many of us, this weekend will not be one of them. Thank you. Especially Karl, The National Library and Matahiwi Marae. A quick trip into Havelock North to drink the best coffee and eat the best lemon tart in a cafe on the brink of closing for the day. Peter was a very good guide. The writers, friends and family ate at Pipi Cafe, a cafe renowned for its love of poetry and its excellent pizzas in Havelock North. This entry was posted in NZ author, NZ poetry, NZ poetry event, Uncategorized and tagged Bill Manhire, Chris Price, CK Stead, Gregory O'Brien, NZ Poet Laureate, Peter Buck, Te mata Estate on April 5, 2016 by Paula Green. This event prompted me to hunt for cheap fares to Wellington because it seemed like a rare and special poetry occasion. And it was! A sold-out event! The National Library, as current administrator of the NZ Poet Laureate awards, hosted the evening as part of Wellington Writers Week. John Buck from Te Mata Wines instigated the Laureateship in 1997, with Bill Manhire taking the debut spot. John was there with wine to share. He still retains an involvement. Fergus Barrowman from VUP was the MC. 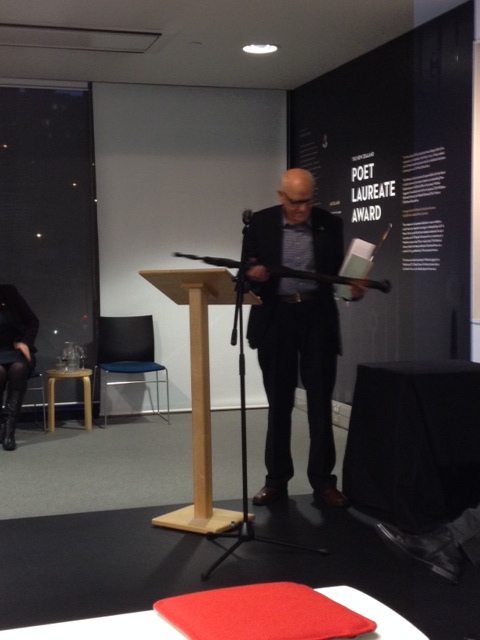 He made the important point that the award is ‘an activist portfolio not just an honour.’ The earliest debut publication by a Laureate was in 1964 while the most recent debut was 1988. Three generations of poets! Cilla McQueen and Michele Leggott calculated over 700 years of life/poetry experience across the ten laureates to date. Bill Manhire (1997) spoke about what the Laureateship meant to him and the two ways it expanded his sense of what he might do as a poet, as a public figure. Firstly he began to write poems with some kind of public dimension. Secondly he explored the way the role centred on the promotion of poetry. He wanted to ‘talk it up.’ Both are options we can be thankful for. Bill’s poems that stand on a public stage are poems that embrace the knots and crests of humanity. I talked about the way ‘Hotel Emergencies’ does this on Summer Noelle in January. Bill read ‘Erebus Voices’ and I sat there thinking this is a poem that belongs in the world and can be heard again. And again. And then again. Because it both moves and matters. Bill shows so adeptly the way poems can shift us to laughter, to wry grins at the surprise of it all, but also lead to far more unfathomable movements of the heart. Hone Tuwhare was represented by his son Rob. We listened to Hone read ‘No Ordinary Sun,’ we listened to Rob read Hone and then Rob picked up his guitar and sang a Graham Brazier version of one of the poems. A version of friendship. Quiet, haunting, utterly melodic. This was love. Hairs standing on your arm on end from start to finish in the Tuwhare bracket. Elizabeth Smither read a cross section of poems that delighted the audience. But one as-yet-unpublished poem in particular stuck to me. Kate Camp, her mum and I – all went ‘wow.’ I adored the story of Elizabeth seeing her mother move through her house, the windows bright, unaware of the daughter driving by. By the time I got to congratulate her, dear Elizabeth had already signed her copy for Kate. How lovely! Like a bouquet of flowers. Elizabeth emailed the poem so I can read and write about it for my book. Michele Leggott, like Bill, brings poetry to a a public arena through her tireless promotion and expansive love. Michele read an extract from a long work (‘The Fasciclies’) that bridges Taranaki and Lyttelton, the 1860s and the 1970s, and the connections between two women. My notebook is full of Persian-like doodles of birds and shapes interspersed with notes but, as I listened to Michele, my pen stalled. I felt like I could hear Robin Hyde with her luminous detail and observations in the seams. For this was luminous writing. There is a bridge between reader and poem. Sometimes you cross it. Sometimes it seems impassable. I just wanted to cross the bridge and read the whole poem. You can find the whole piece here. Cilla McQueen read ‘Ripples’ a long poem that showcases her strengths as a writer. It is in her latest collection, The Radio Room (2010). Another highlight. Other poets make an appearance, Joanna and Hone. Moving. Uplifting in a way. Cilla McQueen’s memoir is due next week from Otago University Press. Vincent O’Sullivan has a new book out from VUP, which I am about to review for a newspaper, so perfect to hear him read his poetic contours. He has the ability to refresh anything. To tilt tropes, to enhance the music of a line, to poke you with an idea, to make you feel. Once again I got caught up in the moment of listening and didn’t catch lines in my notebook. Ck Stead is the current Poet Laureate. 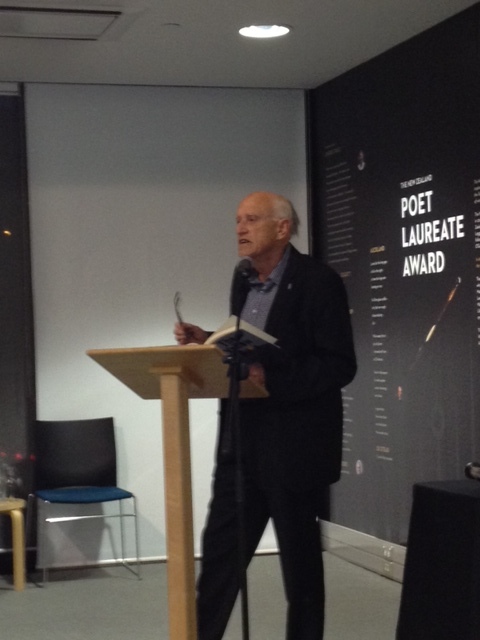 He began with a poem about Allen Curnow, who he felt would have been Laureate if he had lived within the Laureate time span. Karl had struggled over whether to read a top-hit kind of poem or read new things. I know that feeling and first thought I would only ever read a poem once in public when first published. That soon fell by the wayside. It was a moment of audience empathy as Karl confessed he thought he would read it, then wouldn’t, then finally after hearing Bill, decided he would. And we were glad, indeed, as he read an elegy for his mother. Utterly moving. Poetry is such a love for Karl. He made this clear when I was filming his ‘thank you’ speech for the Sarah Broom Poetry Award. And hearing him read on this occasion, lifted the poems off the pages where I have loved them, to a new life in the air/ear. Karl filled the room with the warmth of poetry. Music. Heart. Ideas. A perfect end. The tokotoko table, with all the talking sticks carved especially for each poet, was like a quilt with stories. I wished someone had held up the mother tokotoko for all to see and told that story. And indeed held up each tokotoko, for each tokotoko has its own. Karl will get his at the Matahiwi ceremony in April. I am honoured to be part of this occasion along with Gregory O’Brien and Chris Price. A Circle of Laureates was a magnificent occasion. I bumped into Elizabeth Knox the next day and we were both enthusing about how good it was. Peter Ireland from the National Library had put in all the hard work! Kindly acknowledged on the night by Ian. Every poet held my attention. There is a big age range here, but to me, it is a way of honouring our poetry elders. As a poet, I write with one foot in the past and one foot in the future.I want to know who I’m writing out of. This is my tradition. This is my innovation. This circle. It reminded me of Selina Tusitala Marsh’s’s poem ‘A Circle of Stones in her debut collection where she honours the women she writes from, towards and beside. Thank you to everyone who made this event possible. It was worth my spur-of-the-moment cheap flight, my accidental data blow out, my misbooking home that meant a new booking, the chance to hear the Lauris-Edmond finalists, and losing myself in Jessie Mackay in The Alexander Turnbull Library. Thirty-six hours of poetry. Heaven. Thanks! Ten Poets Laureate to celebrate! This entry was posted in NZ author, NZ poetry, NZ poetry book, NZ poetry event, NZ Poetry reading, Uncategorized and tagged A Circle of laureates, Bill Manhire, Brian Turner, Cilla McQueen, CK Stead, Elizabeth Smither, Hone Tuwhare, Ian Wedde, Jenny Bornholdt, Michele Leggott, NZ Poet Laureate, Vincent O'Sullivan on March 14, 2016 by Paula Green. The Poet Laureate Celebrations includes this event! Looking forward to my trip south. This entry was posted in NZ author, NZ poetry, NZ poetry book, NZ poetry event, Uncategorized and tagged Chris Price, CK Stead, Gregory O'Brien, NZ Poet Laureate on March 2, 2016 by Paula Green. 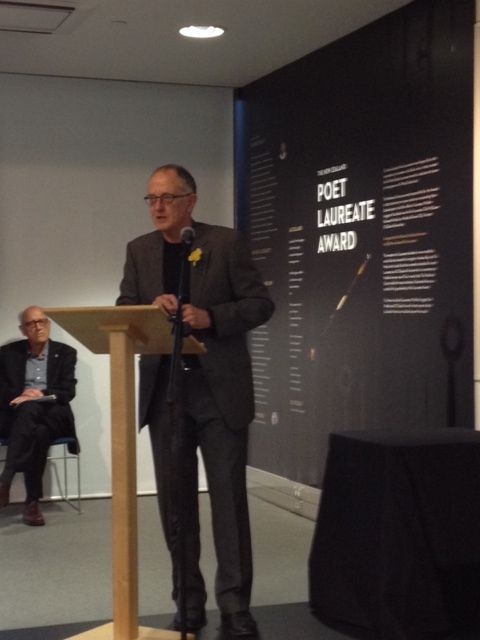 Last night CK Stead was awarded the 2015 NZ Poet Laureateship at the National Library in Parnell with the support of friends and family. Chris Szekel, Head Librarian at The Alexander Turnball Library, and responsible for the award, steered the speeches. Ian Wedde, as a former Laureate said a few words, The RT Hon Maggie Barry, as Minister of the Arts, said a few words and then it was over to Karl. He acknowledged presences (atua) in the room with him (Allen Curnow, Kendrick Smithyman, Bill Pearson, Maurice Shadbolt, Maurice Duggan, Keith Sinclair). His fellow writers. I found this very moving. He acknowledged writers in the room and his family. 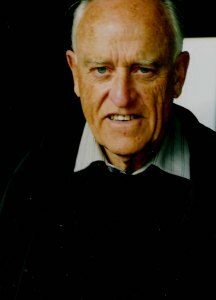 Karl read two poems, ‘Look Who’s Talking’ and ‘Crossing Cook Strait,’ suggesting the writers behind these poems, James K Baxter and Curnow, would have been Laureates if the award had existed then. It was very clear that this writer, writes out of mesh of poetic relationships. Vitally so. I drove back west from a lovely occasion – full of the warmth generated by a shared love of poetry and admiration of one of our most esteemed poets. It touched me. This entry was posted in NZ poetry, NZ poetry event, NZ Poets, Poetry, Uncategorized and tagged CK Stead, NZ Poet Laureate on August 29, 2015 by Paula Green. CK Stead is our new Poet Laureate. I was in the thick of stand-still, rush-hour traffic on the way to a South Auckland School this morning when I heard the news and it gave me a much needed boost. Poetry has always been a primary love in the broad spectrum of Karl’s work. His poetry catches your attention on so many levels because his poems become a meeting ground for intellect, heart, experience, musicality, craft, acumen, a history of reading and thought, engagement with the world in all its physical, human and temporal manifestations. I am delighted to celebrate this result. Your poems are delightfully complex packages that offer countless rewards for the reader—musicality, wit, acute intelligence, lucidity, warmth, intimacy, playfulness, an enviable history of reading, irony, sensual detail, humour, lyricism. What are key things for you when you write a poem? It has to be a meeting of words and feeling, in which the words are at the very least equal in importance, and the feeling can be of any kind, not just one kind. I like wit, think laughter can be tonic, but of course it doesn’t fit all occasions. There were a number of significant poets in NZ from the 1940s onwards and you have interacted with many of them (Curnow, Mason, Glover, Baxter and so on). Were there any in particular whose poetry struck a profound chord with you? Curnow was always the most important for me. But when I was young Fairburn’s lyricism seemed very attractive; Glover at his rare best (the Sing’s Harry poems); Mason likewise (‘Be Swift O sun’); Baxter – especially in his later poems: they have all been important to me. Do you think your writing has changed over time? I see an increased tenderness, a contemplative backward gaze, moments where you poke fun at and/or revisit the younger ‘Karls,’ a moving and poetic engagement with age, writerly ghosts and death. Yet still there is that love and that keen intelligence that penetrates every line you write. You are very kind! I certainly feel ‘older and wiser’ in the sense that things don’t matter so much, one accepts the fact of human folly and one’s own share in it. Indignation doesn’t stop, but there is a kind of weary acceptance, and laughter. I still feel embarrassment – especially when looking back – but I recognize that as not only a safeguard against social mistakes, but also as another manifestation of ego, as if one feels one should be exempt from folly. There have been shifting attitudes to the ‘New Zealand’ label since Curnow started calling for a national identity (he was laying the foundation stones that we then had the privilege to use as we might). Does it make a difference that you are writing in New Zealand? Does a sense of home matter to you? When I was young I was a literary nationalist. Now I regard nationalism as a form of tribalism and the result of genetic programming no longer suitable or safe in the modern world. So I have changed a lot. But I still recognize regional elements as important, even essential, in the poetic process. I think Curnow himself became more a regional poet and less a nationalist one; but the arguments that had swirled around all that had had the effect of committing him to positions which he didn’t want to resile from, so he remained the committed nationalist, perhaps after the need had passed. What irks you in poetry? What delights you? I suppose any kind of excess, of language or of feeling; and solemnity – especially the sense that poetry is taking itself too seriously and asking for special respect. There are many kinds of delight in poetry, but almost all of them involve economy. If an idea or an experience or a scene or a personality or whatever can be conveyed as well in 10 words as in 20, those 10 words will be full of an energy which the more relaxed and expansive version lacks. They will be radio-active. Name three NZ poetry books that you have loved. Singling out living poets might be invidious, but here are three by poets now dead: You will know when you get there (Curnow); Jerusalem Sonnets (Baxter); Pipe Dreams in Ponsonby (David Mitchel). This entry was posted in NZ author, NZ poetry, NZ Poets, Poetry, Poetry Awards and tagged CK Stead, NZ Poet Laureate, Poet Laureate on August 11, 2015 by Paula Green.